Verdicchio is a grape that can be viewed as symbol for the Marche. It is believed to be native to this region, and was mentioned in documents as early as the 14th century. Of the two appellations, Jesi and Matelica, we prefer the latter, which produces a firmer more aromatic wine. The Accattoli winery nestled in the hills bordering Umbria, made this fabulous wine. 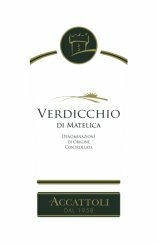 Front Label Translation: " In the charming hills of Metalica, our Verdicchio is born, an ancient symbol of the Marche. The grapes are harvested at the end of October and vinified in a traditional manner. The wine has a straw yellow color with green reflections ......."
Tasting notes: Bright, lemony fruit with a creamy mouthfeel finishing with a refreshing crisp acidity.